So, your development project has been humming along nicely on MongoDB, until it was time to deploy the application. That's when you called your operations person and things got uncomfortable. NoSQL, document database, collections, replica sets, sharding, config servers, query servers,... What the hell's going on here? It should not be a surprise for an ops person to question the use of a new database system. Monitoring the health of systems and ensuring they perform optimally are what operations folks do. Time will need to be spent on understanding this new database works, how to deploy so as to avoid or minimize problems, what to monitor, how to perform backups, how to add capacity and how to repair or recover the cluster when things really go wrong. MMS is a free SaaS solution from MongoDB Inc. to monitor system metrics (1 minute resolution) and send email alerts upon failures. Recently, a cloud backup feature was added. ClusterControl is an on-premise tool with combined monitoring, cluster management and deployment functionality. It provides high granularity monitoring data (down to 1 second resolution), providing sufficient depth of information to support detailed analysis and optimization activities. It is possible to run both MMS and ClusterControl on your existing MongoDB or TokuMX cluster. You can see how the graphs compare in this blog post. In this post, we are going to show on how to install ClusterControl on top of your existing MongoDB/TokuMX Replica Set using the bootstrap script. Note that you are able to colocate ClusterControl with any of the mongod instances. 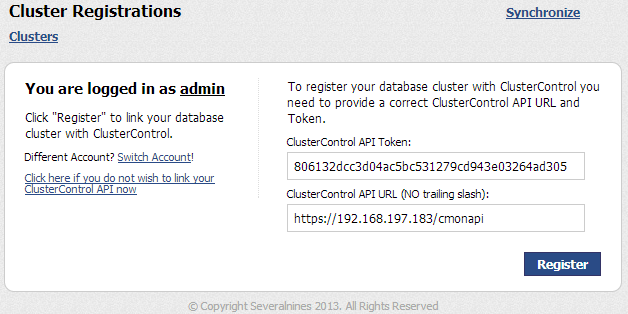 ClusterControl requires every mongod instance to have an associate PID file. This includes shardsvr, configsvr, mongos, and arbiter. To define a PID file, use --pidfilepath variable or pidfilepath option in the configuration file. Starting from version 1.2.5, ClusterControl is able to detect PID even without specifying pidfilepath. MongoDB Replica Set/Sharded Cluster has been configured as a cluster. Verify this with sh.status() or rs.status() command. Ensure that the designated ClusterControl node meets the hosts requirement. We have a three-node MongoDB Replica Set (one primary, one secondary and one arbiter) running on Ubuntu 12.04. All mongod instances have been installed through 10gen apt repository. ClusterControl controller will be installed on mongo3 so this is where we will perform the installation. mongo3 is configured as an arbiter to the replica set. ClusterControl requires an email address to be configured as super admin user. We presume that all hosts in the cluster are running on the same OS distribution. ClusterControl needs to use a shared key to perform installation and management on all hosts. We presume all hosts in the cluster are running on the same SSH port. ClusterControl needs to have a directory for installation purposes. ** MongoDB Replica Set: Minimum 3 nodes (with arbiter) are required (excluding ClusterControl node). ** MongoDB Sharded Cluster: Minimum 3 nodes are required (excluding ClusterControl node). ClusterControl requires MySQL server to be installed on this host. Checking for MySQL server on localhost..
ClusterControl will create a MySQL user called 'cmon' to perform management, monitoring and automation tasks. Checking for Apache and PHP5..
Found Apache and PHP binary. Configuration is now complete. You may proceed to install ClusterControl. From the ClusterControl UI, you can click the “Help” menu (located on top of the page) for a product tour. This is a quick way of getting to know the functionality available on the current page. If you encounter any problems during the installation process, or have any questions, please visit our Support portal at https://support.severalnines.com/. Congratulations, you’ve now got cluster management for your existing MongoDB/TokuMX Replica Set!